This past Wednesday morning I welcomed Mrs. Amanda Lincoln and two of her three kids, Philip Eleanor and Hannah Schumacher, aboard for the 7th SKIFF program fishing trip of the 2017 season. Hannah Schumacher and Philip Eleanor enjoyed a SKIFF program trip provided free of charge to military kids whose parents are away from home serving the nation. The kids landed 101 fish under ideal topwater weather conditions. 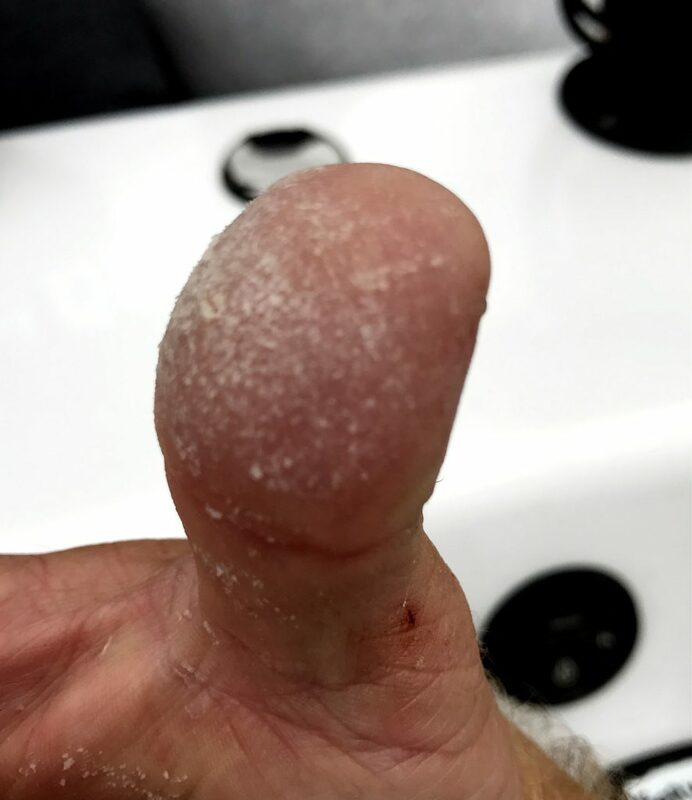 My thumb after a morning of taking off 101 fish, more than half of which were largemouth bass. US Army Staff Sergeant John Lincoln is currently away from Fort Hood training cadets at Fort Knox, KY. SSG Lincoln has been in the military for 12 years. He got to join us briefly via Facetime as the kids were catching fish near the end of our morning trip. It was a really ideal morning for topwater action. The winds were calm, the sky was grey, and the fish stayed in a strong feeding mode for an extended time this morning. We began the morning downrigging by, by 6:40am, multiple schools of mixed white bass and largemouth bass could be seen crashing shad on the surface. We quickly transitioned to casting grubs on jigheads using light spinning gear and the kids proceeded to “wear ’em out” for the next 3 hours. 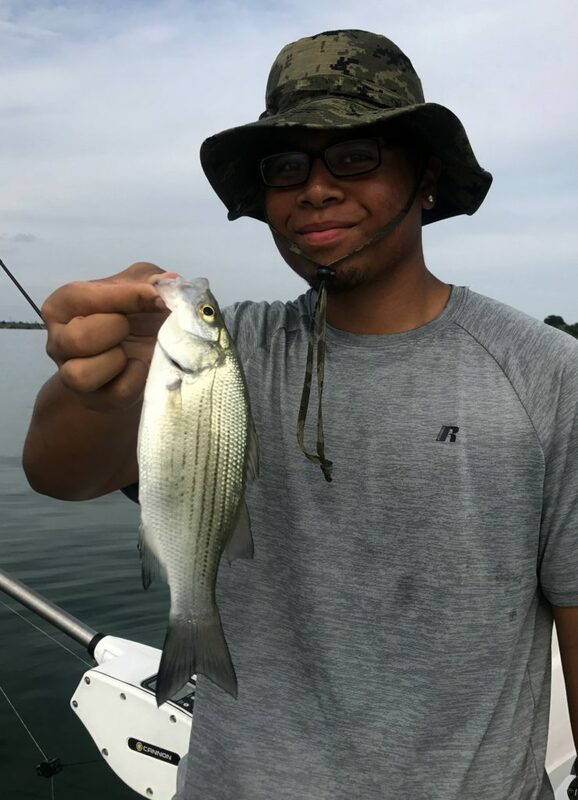 After the surface bite died, we pulled out a little further from shore where sonar revealed mainly white bass holding in large schools of 40-50 fish. We worked these fish over until the kids’ wrists were sore and took our tally to 101 fish landed before calling it a good morning. Small, shad-imitating presentation in natural hues are key to the presentation. This past Tuesday morning I fished with Ethen and Alex Wells of Temple, accompanied by their mom, Sabrina. Alex set the tone for our 114 fish trip with a triple on the very first downrigger set we put down this morning. 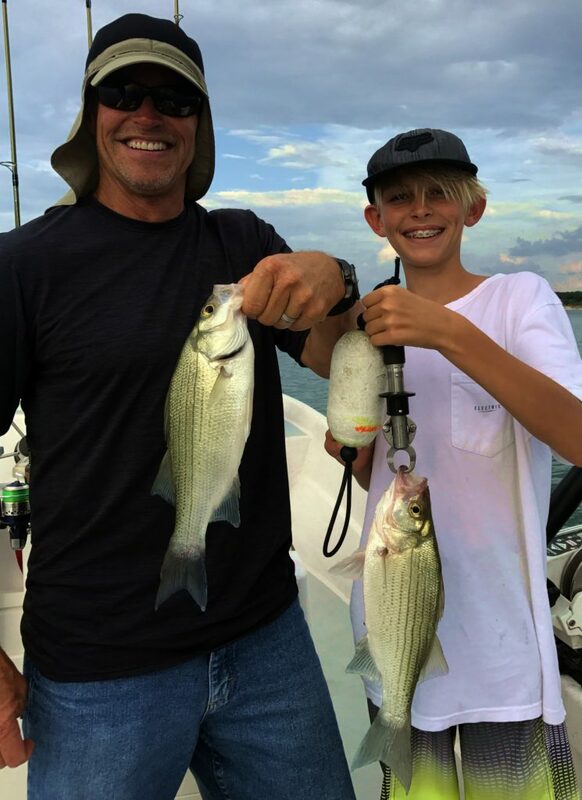 Just past the mid-point of our trip, we found some deep white bass in the lower fourth of the water column and got them worked up into a frenzy, allowing for a catch of over 50 fish from an area the size of my boat. Ethen shows one of the 2-year class fish common in this congregation of fish. Both boys had prior fishing experience and were both capable with spinning gear. Most of their prior efforts had been made casting from the bank. Before we shoved off from the courtesy dock, I went over how to hold and reel a baitcaster – – the kind of reels I use for downrigging, and how to hold and cast a spinning rod in case we ran into fish feeding on top water. 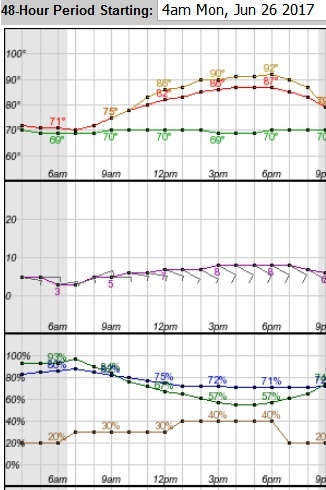 A very light easterly wind continued today with about 30% cloud cover on an otherwise fair sky. These near-calm conditions made for excellent sighting of any fish breaking the surface. Several minutes before the sun rose, I saw individual white bass dimpling the surface in a fairly small patch of water and, after seeing suspended fish down around the 20 foot mark on sonar in the same vicinity, decided we would attempt downrigging to start the day. As I put the first downrigger down and explain to the boys how to do so in order that they could rig up their own downrigger for the remainder of the trip, we got Alex’s rod down and his rod went off with a triple before we could even get Ethen’s rod in the water. Over the next 25 minutes we landed 22 fish including three sets of triples and a number of doubles and singles. To satisfy the boys’ bent for competition, Sabrina “kept score” of how many fish each boy caught by using her cell phone as a counter. All of these fish came on my summertime favorite – – a three armed umbrella rig equipped with Pet Spoons. These Pet Spoons do a very good job of imitating the young of the year shad so prevalent in the white bass diet right now. After this area settled down, we moved to deeper water and began seeking out large schools of fish that we could hover over top of and jig for. 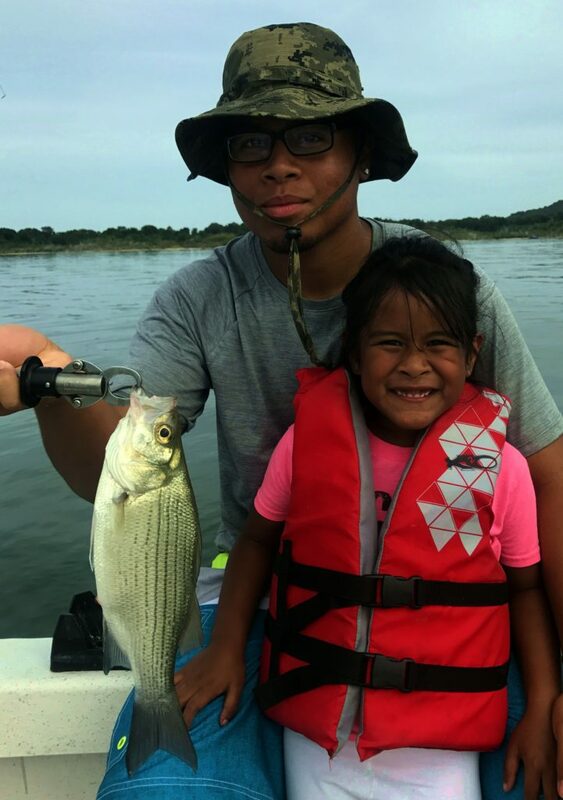 We made one stop over a fairly sparse school of deep white bass and I hoped we could get them to coalesce beneath us using the thumper and by creating our own commotion by jigging, but, that did not pan out. After going back to downrigging for a bit in order to cover water and catch fish as we did so, we found a nice school of fish in the lower 7 feet of the water column in about 54 feet of water. Using the Spot Lock function on the Minn Kota Ulterra, we hovered right over top of these fish and they stayed put long enough for us to get our first presentation of slabs down to them. Once the first fish was hooked, the school went on a frenzy. We sat over top of these fish and put 53 in the boat over about an hour’s time. Eventually these fish played out and we returned to downrigging only to mop up a few more fish in the same general area before it became clear this bite was over. On the now glassy, calm surface, there were no baitfish nor gamefish apparent whatsoever. We used slip float rigs on poles baited with worms and very quickly took our count from 75 fish to a final tally of 114 fish as the boys very handily got the hang of using poles to present our finesse offerings to sunfish of various species. As we wrapped up our efforts right around 10:15, Sabrina commented that a trip to Academy for sunfish poles was most likely in their very near future! This past Monday evening I fished Stillhouse with Californian-soon-to-turn-Texan Rick Snelgrooes, his 13-year-old son, Sean, and Rick’s friend, Stuart Gehrke of the Austin area. Rick Snelgrooes and his son, Sean, with a pair of 3-year-old Stillhouse Hollow white bass. We downrigged until we found strong congregations of fish on bottom, then hovered over these fish using Spot Lock to then work slabs through the school. Rick, a sailor at heart, decided to sample the area’s angling opportunities as he and his wife consider buying a home and property in the Georgetown area. Our time on the water was pretty evenly split tonight between downrigging and smoking slabs. The downrigging allows for a continuous catch of fish while at the same time allowing for a methodical sonar-search of fish-holding areas. When solid concentrations of bottom-hugging white bass were found on sonar, we immediately set up over top of them in a hover to work them over with slabs. Using the trolling motor/sonar connection known as i-Pilot Link allows me to touch the screen of my Humminbird sonar, place a crosshairs over fish schooling together on bottom, then give the trolling motor a “go to it and stay on top of it” command. As the trolling motor does its job, I have a few moments to clear the downrigging equipment and get slab rods in everyone’s hands so we are all ready to drop slabs on top of the fish once the boat is in a hover over them. Tonight, with 4 rods working, this put a lot of fish in the boat. As we caught our 50th fish, then our 60th, Sean asked what the average catch was on such a trip. I told him last year’s average was ~72 fish per trip. Once he heard that and realized we were still just short of 72 fish, he redoubled his own efforts to help get us to that mark. After steadily landing fish and exceeding the 72 fish mark, Sean then asked if it would be possible to catch 100 fish. With about an hour’s time left, I told him that would be possible, but that we’d have to work at it. Due to the sun being obscured behind a thick bank of clouds in the west, “sunset” came earlier than normal this evening, thus cutting down on the time we’d have to make good on our pursuit of 100 fish. After the deep slabbing bite died, we revisited the area where we’d first contacted fish with the downriggers shortly after launching. Long story short, as 8:44 rolled around, Rick’s rod and Sean’s rod both went off within seconds of one another as they sat positioned in the downriggers’ rod holders. In came two yearling white bass — #100 and #101. We celebrated a bit with that milestone reached and, as we drove in, I told Sean about the truth of Proverbs 29:18 which says, “Where there is no vision, the people perish…”. In this case, had we not set a goal of 72 fish, then of 100 fish, we most likely would not have seen that many fish landed as the inclination to stay focused and work towards that goal just would not have been there. This was a great trip with great folks and we wrapped up with exactly 101 fish landed on the evening. This past Monday morning I fished the sixth SKIFF (Soldiers’ Kids Involved in Fishing Fun) program trip of the 2017 season with returning guests Charley and Addison Elgin. We found willing white bass from the surface to the bottom this morning with largemouth bass pointing the way to them as they thrashed shad in the upper 4 feet of the water column. Charley really got good at sight casting accurately with both a lightweight grub on a jighead and with a heavier slab to cover distance. He worked over the largemouth up high, while Addison worked the white bass down below. These siblings joined me previously while their dad, US Army Specialist Sean Tinkelenberg, was deployed to Southwest Asia. After being on the ground a few months at Fort Hood he was assigned to train cadets at Fort Knox, KY, this summer. After some pretty turbulent weather over the weekend, the sun cleared from behind a low deck of clouds in the east right around 6:30 and, with calm wind conditions, topwater action by largemouth bass and white bass was easy to spot. This surface feeding behavior has just taken on the first bit of consistency in this summer season and we should see it continue in all but turbulent weather conditions. We fished just one area this morning about 4 to 5 acres in size and caught largemouth bass in the upper 4 feet of the water column on both slabs and grubs, and we caught white bass throughout the water column down to as much as 68 feet deep on slabs using a smoking tactic. 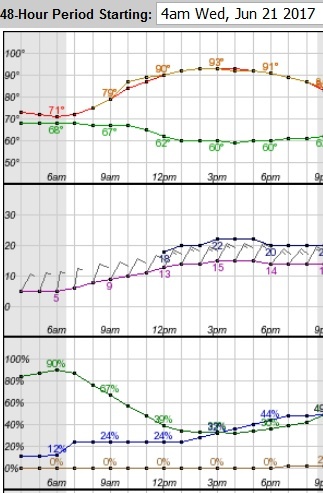 It is clear that no thermocline has yet set up. 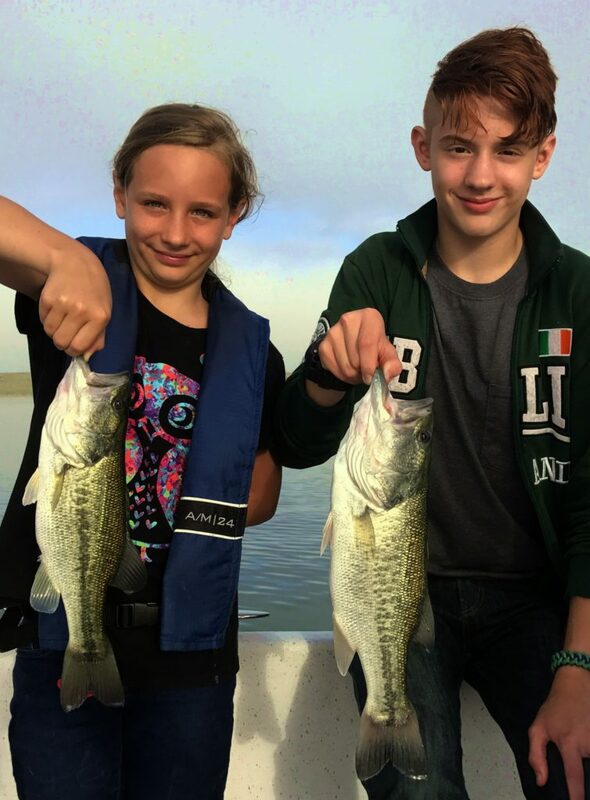 Because the kids came into this trip with prior experience under their belt, they were able to capitalize on all the potential the fish offered this morning. Charley and Addison wound up landing 106 fish this morning with very few fish hooked and missed. Honestly, most adult clients don’t demonstrate such a good hook-to- land ratio. I told the kids’ mom I would have them back to the dock right at the 4-hour mark, around 10:15, and for better or for worse, the fish tapered off right around 9:50, so we were able to head in punctually without leaving the fish biting. This past Saturday afternoon I conducted the fifth free SKIFF program trip of the 2017 season, welcoming aboard Mrs. Mylani Cantero and her three children, Chloe (age 5), Boyka (age 6), and Ben (age 17). 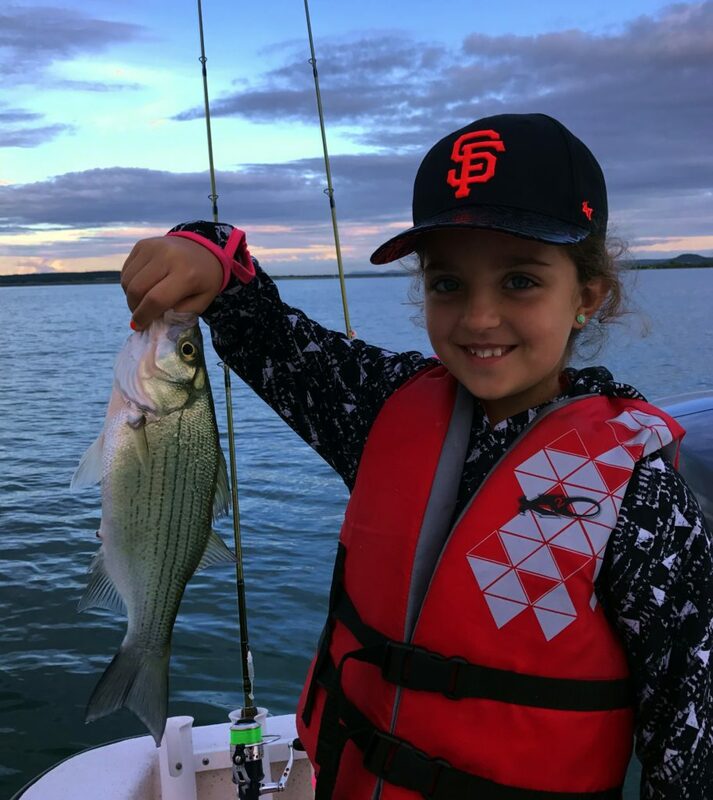 Chloe Cantero, age 5, caught this 13.25 inch white bass — the first fish of her life. 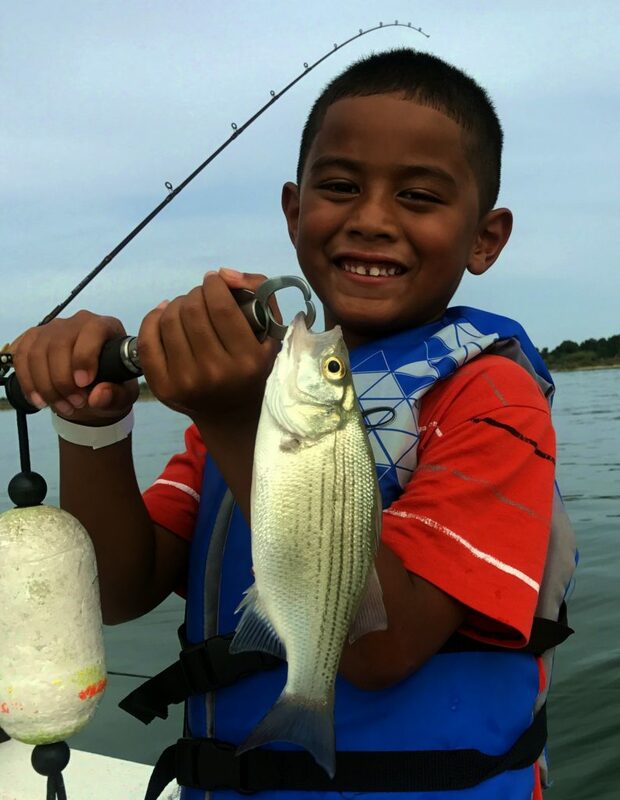 Boyka Cantero, age 6, also caught his first fish during a free SKIFF program fishing trip available to all military kids separated from their parents. 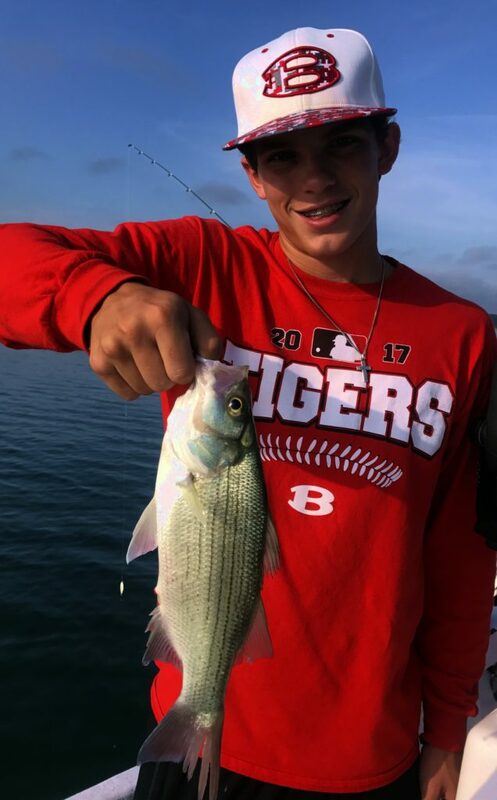 Ben Kalio, age 17, took care of his siblings first by helping me operate the downriggers we fished with, and then caught the first fish of his life, as well. Mylani’s husband, US Army Staff Sergeant Charles Cantero is currently deployed to Kuwait. 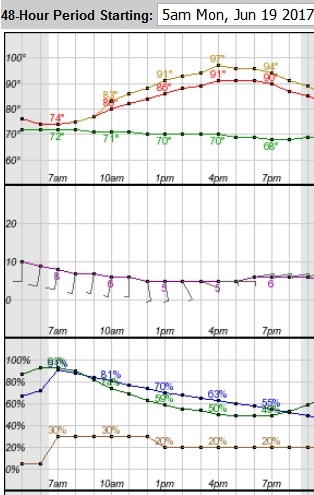 Our trip was initially scheduled for this morning, but a slow-moving line of storms which dropped over 3 inches of flooding rains on the Waco area, moved into our area right at sunrise and persisted through 3 PM. When we met at 4:45 PM, I asked about the kids’ prior fishing experience. None of the kids had ever caught a fish before. I explained that Texas was a great state to catch your first fish in because the Texas Parks and Wildlife Department offers a “First Fish Certificate” to those landing their first fish in the Lone Star State. To say that it was hot would be an understatement. 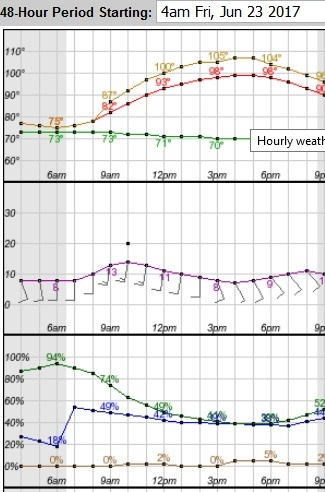 We had a humidity level near 100%, cloudless conditions, and the sun shining brightly after the storms passed. This definitely did not make for great fishing conditions, nor great conditions to have young children in the outdoors. The kids were already sweating as they sat still, even before I had them place their life vests on. My first instinct was to get the boat moving and to do some downrigging so as to create our own breeze and make the trip a bit more comfortable for all concerned. We did so, and with our downrigger ball set around 24 feet, scored a first fish for each of the kids within our first 25 minutes on the water. Each child landed a cooperative white bass. As is often the case with young kids, even when success is coming our way, the novelty can wear off and the kids start getting fidgety. I am very vigilant about looking for this and transitioning to something new when I see that happening. So, shortly after everyone caught at least two white bass we moved on to targeting sunfish in shallow water. We were successful at that endeavor, allowing everyone to catch at least two sunfish. Next, it was back to downrigging for a few more white bass, and then back to sunfishing for a few more sunfish coming off of a thick hydrilla bed. Because some younger kids just simply can’t make a full four hours on the water, I let Mrs. Cantero know that if we needed to conclude the trip a bit earlier then the planned time of 8:45, that she could let me know that. Around 8:15, our youngest, Chloe, had absorbed all of the fun and sun she could stand and Mrs. Cantero let me know that it would be a good time to head back to the boat ramp. We concluded the evening’s efforts with 27 fish landed and three First Fish Certificates earned. This past Saturday I helped 10-year-old Kyle Benson of China Spring, TX, celebrate his birthday along with his grandpa, William Dickson, and his step-dad, Kyle Jewell. Largemouth, white bass, and freshwater drum were stacked in and around a 50 foot draw and readily struck our white Redneck Model 180 slabs with Hazy Eye Stinger Hooks attached. We landed 60 our our 100 fish fishing this shoal of fish with a vertical approach. We got going right at 6:15am and, after the skies brightened a bit, found a collection of white bass “wolf packs” occupying a patch of water about 5 acres in size. These fish were holding together in groups of 6-10 fish per “pack” and were suspended at around 31 feet beneath the surface. 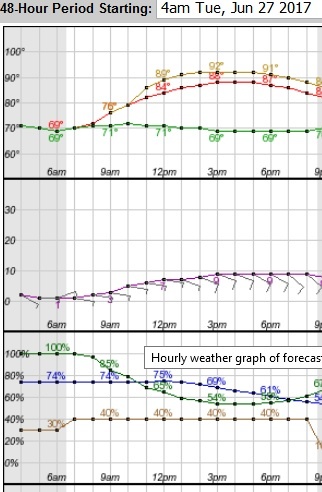 This scenario is just right for downrigging and that is exactly how we approached this situation. Running a pair of downrigger rods, each equipped with a 3-armed umbrella rig complete with a trio of Pet Spoons, we took singles and doubles for about a 90 minute span, taking our tally up to 31 fish. After the fish dispersed and the fishing slowed, we moved on. Next, I searched for fish in a large, deep draw and, after a bit of sonar work, found enough white bass holding closely enough together that I felt a vertical tactic, aided by the consolidating influence of my thumper, would be effective. We put the boat into a hover over this bottom feature using the Minn Kota Ulterra’s Spot Lock feature, got the thumper going, and got 4 slabs working vertically. Before long, the colored sonar began to reveal fish coming in to the commotion we were creating. Once we caught the first “icebreaker” fish, it was game on. We sat in this one area for another 90 minutes and landed a total of 60 additional fish including mainly white bass with a few largemouth and drum sprinkled in. As this bite died right at 10am, our tally stood at 91 fish. I suggested that we head shallow and finish up doing some simple, fun sunfishing with poles and slipfloats, mainly to give Kyle and son a way to catch fish without the aid of a boat. We moved to the back of a cover-filled cove and, in a matter of minutes put 9 more fish in the boat so as to make it a bona fide 100 fish day. 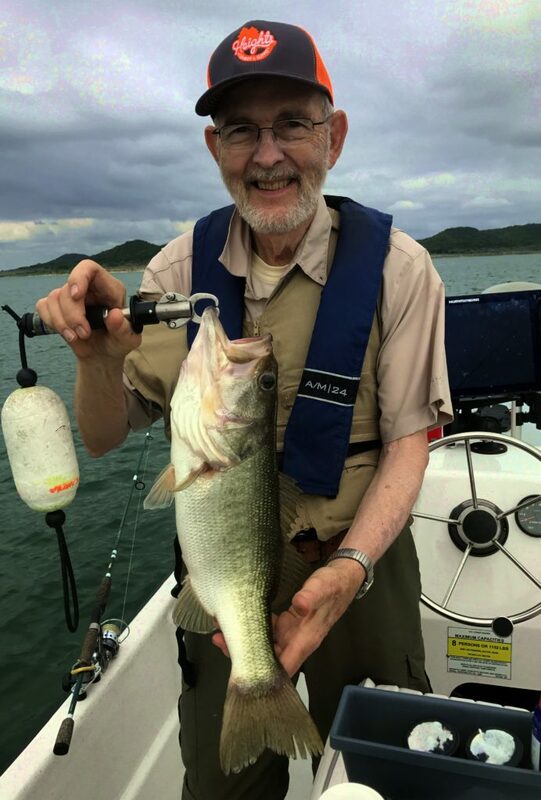 This past Thursday morning I fished a multi-species trip on Stillhouse with retired doctor and Navy Captain Ray Johnson, accompanied by his neighbor, Chris Lewis, who serves as the band director at Eastern Hills Middle School in Harker Heights. Largemouth bass were schooling on the surface in force this morning under grey skies and light winds. Sight casting to these “wolfpacks” of fish as they aggressively pursue young of the year shad is challenging and engaging, requiring accurate and timely casts. Ray Johnson was up to the challenge. Ray’s neighbor, Chris Lewis, had fished Stillhouse on a number of occasion but caught his first fish from this 9-mil-long reservoir today. Now into our third day with northerly winds, this morning’s weather presented with full coverage of gray clouds for the entire 4.75 hours of our trip. The combination of a light breeze and grey cloud cover served us well, as it allowed for the very first widespread top water action I’ve seen thus far this season on Stillhouse to occur. Our first stop this morning came in about 37 feet of water on a breakline adjacent to the river channel. Here, white bass were suspended in the lower two thirds of the water column and loosely schooled feeding on young of the year shad. We used a smoking tactic to take a number of these fish over a span of about 45 minutes. Just about the time this bite, which never really got very aggressive, was about to taper to nothing, I spotted consistent bursts of water in the distance – – the telltale sign of fish forcing shad against the surface and feeding on them there. 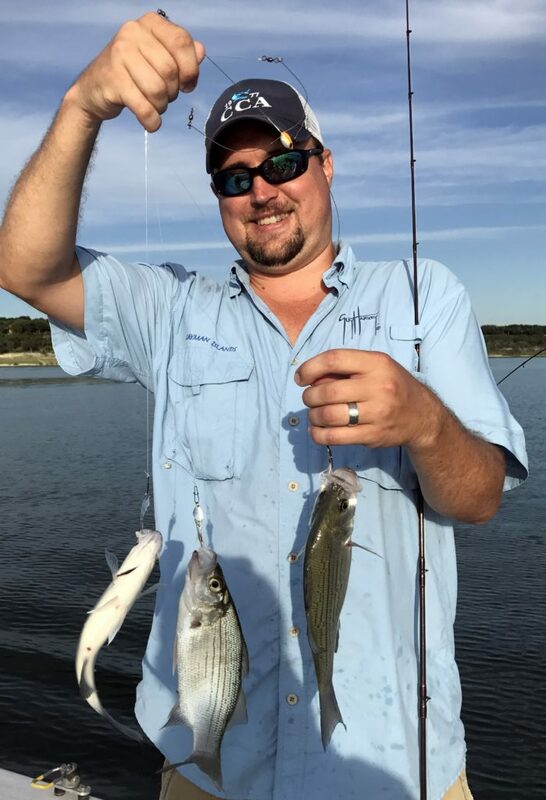 As we slowly motored near these fish, then turned off the outboard and closed the last few yards with the electric trolling motor, I could see we had a mix of white bass and largemouth bass feeding on shad about 1.25 inches in length. Over the next 45 minutes both men were able to sight cast using smoke colored grubs on 1/4 ounce jig heads to tempt a number of largemouth bass ranging in size from 11 to 15 inches. After this action died, and with a total of 25 fish now landed for the morning, I headed to deeper, clearer water in search of schools white bass that we could either downrig for or vertical jig for. Once again, surface feeding fish, including a mix of white bass and largemouth bass, gave away the location many more fish holding closer to the bottom in the lower half of the water column, as revealed by sonar. We spent the balance of our trip using a smoking tactic equipped with three-quarter ounce slabs to which my hand-tied Hazy Eye Stinger hooks were attached, to land and additional 126 fish through 11 AM. We wrapped up our trip today with exactly 156 Fish boated for our efforts, including primarily white bass, with a number of largemouth bass and freshwater drum included in that count. This past Wednesday morning I fished with Marcus Mitchell of the Austin area and his dad, Jim Mitchell, who is visiting from the Cleveland, Ohio, area where he typically fishes for walleye and yellow perch on Lake Erie. Jim Mitchell shows our best hybrid from Wednesday morning’s trip on Belton. The fishing was just so-so on this second day of an atypical summertime north wind. Jim came down from Cleveland, OH, to visit his son, Marcus. Marcus displays his best of the eight keeper (18+ inch long) hybrid we took on live shad today. Given the current fishing situation, I presented Marcus with two options: first, we could focus on pursuing higher numbers of smaller fish by using a combination of downrigging and vertical jigging on Stillhouse, or, we could take a bit slower approach and fish for fewer but larger fish by using live shad for hybrid striped bass over Belton. Jim’s preference was for the larger fish, so, with ample live bait on board, we began our trip at 6:15 and looked for some easy surface action to sight cast for before beginning to grind it out for hybrid in deeper, open water. Thanks to a second day of northerly winds, the topwater bite was not all that strong, nor all that visible in the chop. Add to this the fact that both Jim and Marcus were a bit rusty on the casting, and we were only able to capitalize on the topwater to the tune of five white bass. The fish simply did not stay up very long and so 2 to 3 casts per surface feeding school was about all of the chance we got at these fish. 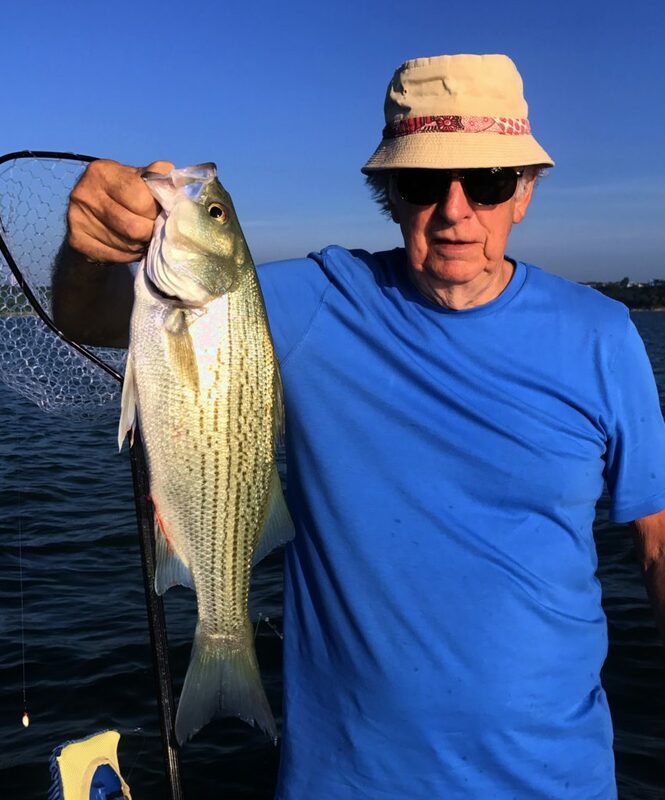 By around 7:15 AM all topwater was done and we began the process of searching out active hybrid striped bass and tempting them with our live shad. We fished four distinct areas, all between 34 and 41 feet deep, and the scenario was very similar at each one. 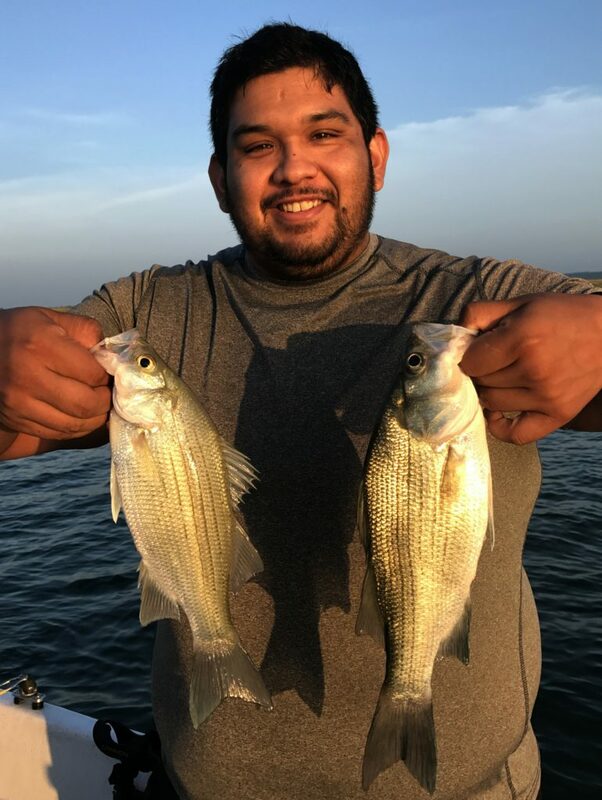 We found white bass, typically heavily schooled and moving quickly about, some fairly reluctant hybrid moving very closely along the bottom, with abundant young of the year shad all throughout the water column, and some pesky, small blue catfish in the lower third of the water column. As we fished these several areas over the four hours that followed, we picked up exactly 31 additional fish, of which eight were legal hybrid striped bass, one was a short hybrid, one was a channel cat, one was a blue cat, and the balance were white bass in the two and three year class. 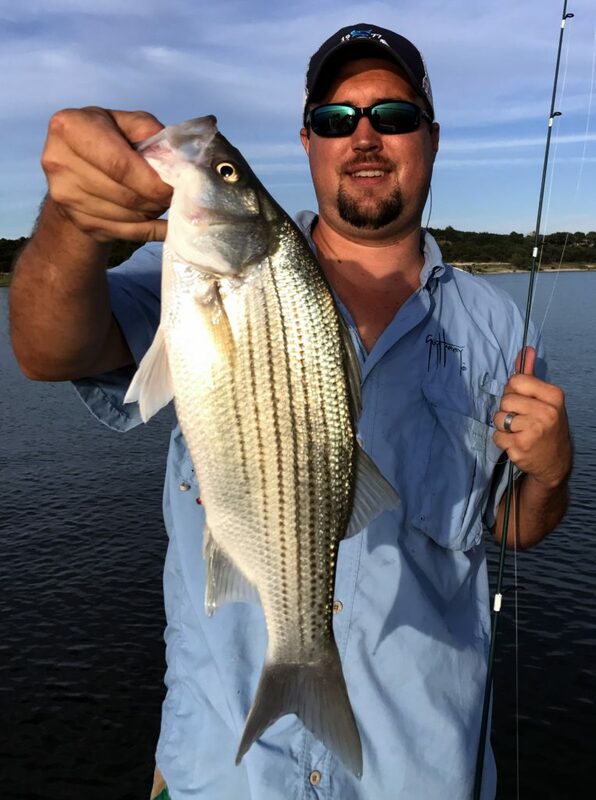 Most of the white bass did not come on our live bait, but rather came on smoked slabs which we dropped down only when I saw abundantly schooled white bass move beneath the boat as shown on sonar. These summer months are my least favorite for pursuing hybrid, as the fishing for that species is generally slow, and hot, and somewhat tedious. 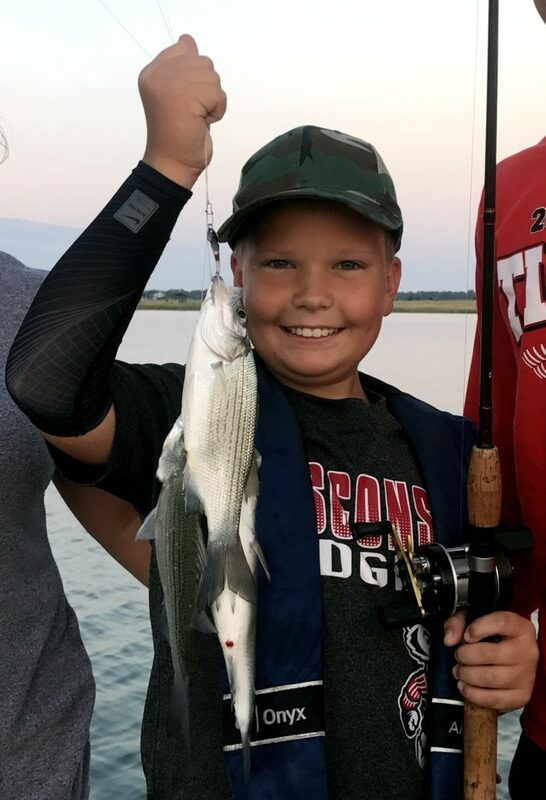 However, for those willing to put in the effort, quality hybrid stripers can certainly still be caught. This past Tuesday morning I fished Stillhouse with high school friends Daniel Gonzalez and Rob Borman. 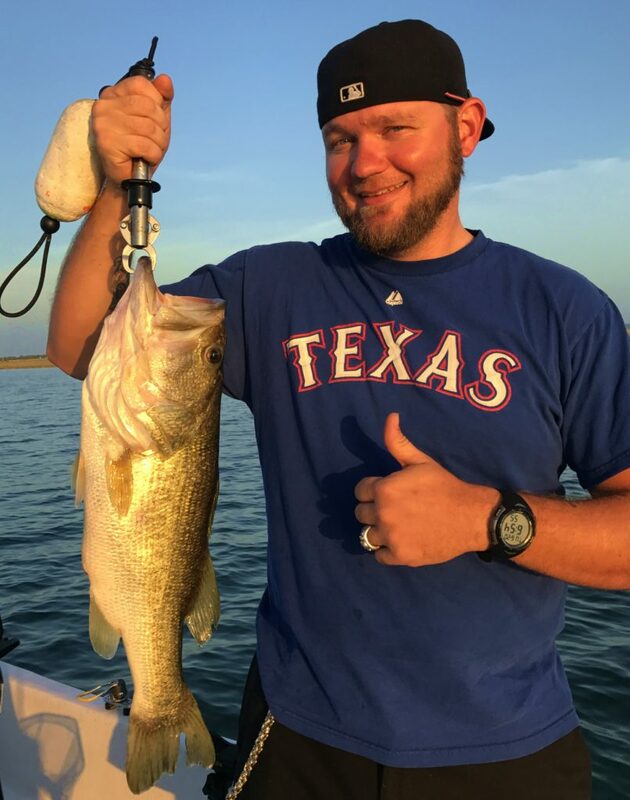 While jigging over the top of a large school of white bass, Rob pulled out this 5 1/3 pound largemouth on the same shad-imitator the white bass found attractive. Daniel poses with a 2-year old and 3-year old white bass he caught early on in the trip as we worked slabs in 35-45 feet of water for aggressive, tightly schooled white bass using Redneck Model 180 slabs with Hazy Eye Stingers attached. The bite was so aggressive that at one point, Daniel actually landed two fish on one lure at the same time. Both fellows grew up in Belton – – Rob stayed local and now drives a truck for McLane’s, and Daniel headed west to Reno, Nevada, where he now manages a casino. Both men have six-year-olds and, on his annual visit home, one of Daniel’s plans was to bring his family to Rob’s daughter’s birthday party, and of course the two fellows needed to do a little fishing along the way. 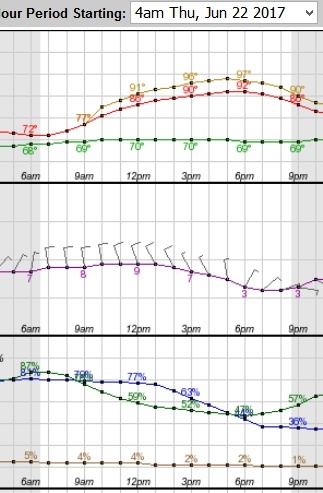 We experienced a third day of winds from a northerly direction with some gray cloud cover in the early part of the trip out to the east, with partially cleared skies for the second half of the trip. We found our first fish right around 6:40 AM on a breakline that drops from 35 feet down into much deeper water. We stayed in this general vicinity for three hours making just three “short hops” over this span of time, and landed over 100 fish comprised mainly of white bass with a few largemouth and freshwater drum thrown in for good measure. The fishing was very straightforward and very effective. We used three-quarter ounce Redneck Model 180 slabs, in white with a Hazy Eye Stinger hook attached. We used a “smoking” tactic in order to tempt fish located from bottom up into the water column some distance off bottom. By 9:30 these fish had lost interest and we had to move on. With the winds now the lightest they had been all morning, and clearing, bright skies, the fishing really dropped off sharply. We only landed five additional fish in our final hour on the water via downrigging as we covered three distinct open water areas. We wrapped up this trip with exactly 109 fish boated for our efforts. This past Monday evening I did a combined sonar training, downrigger training, and fishing trip with Brandon Rudloff. One of the tactics I use while downrigging is to stop over top of larger congregations of any bottom-hugging fish I see on sonar. I then work slabs vertically for these fish and then move on once the school moves or loses interest. Brandon caught this hybrid on such a “slab stop”. Brandon was grinnin’ like a kid when his first triple came over the gunwale using a 3-armed umbrella rig as he learned the ins and outs of downrigging on Lake Belton with me this evening. Brandon is a dedicated catfisherman, typically pursuing large catfish during the cold months. 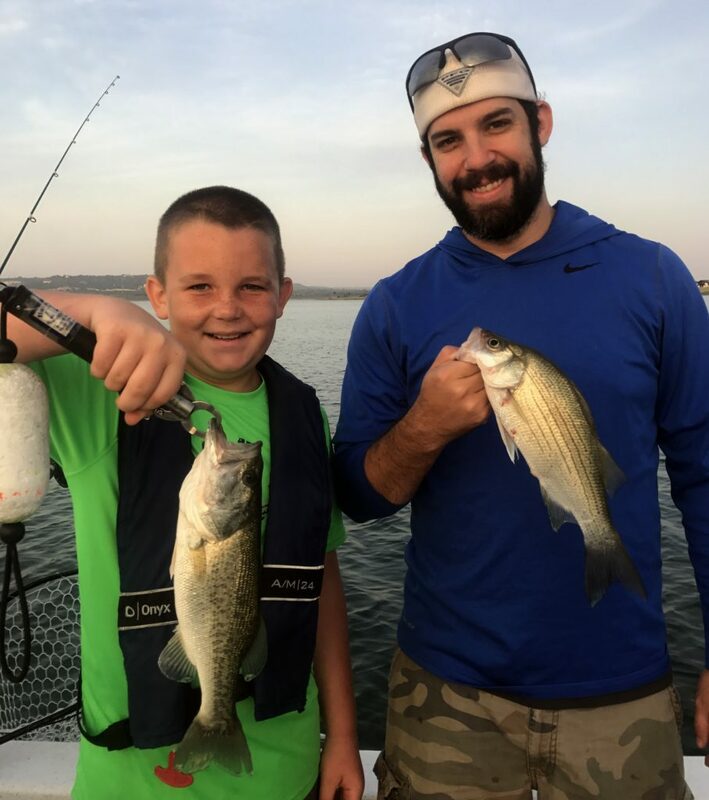 However, with his son about to turn four, Brandon needed to figure out how to steadily catch quantities of fish so as to keep his son engaged. 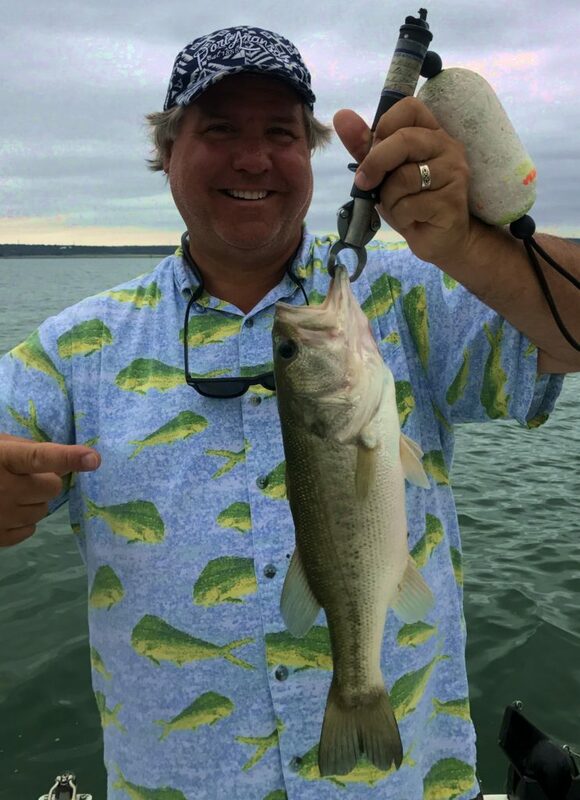 As we met up at Lake Belton, I first went over some sonar fundamentals addressing the pros and cons of traditional colored sonar, of down-imaging, and of side-imaging. We then set out on Brandon’s boat, and dialed in his Humminbird Helix so that the map, the colored sonar, and the down –, and side – imaging were all as fishing – friendly as they could be for him. We then left his boat at the launch area and took my boat out so that I could demonstrate how I use slip floats for panfish, and how I use downriggers for white bass. Brandon immediately grasped the efficiency of my slip float system, and realized he was using tackle much too large, thus only taking the largest of whatever sunfish may be present where he fishes. My method allows even the smallest sunfish to be caught. This, of course, is ideal for youngsters. After that slip float demonstration, we set out to deeper, open water and I begin explaining all the components of my downrigging system. 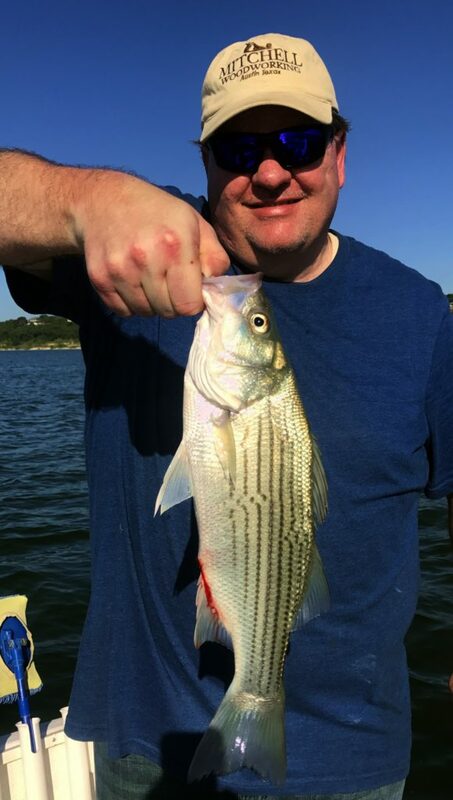 Over the next two hours, we caught singles, doubles, and triples of white bass in the one, two, and three year class taking our tally of white bass to 26, plus a hybrid striper thrown in for good measure, all in addition to the half-dozen sunfish we had landed earlier. The entire time I explained why I was doing what I was doing as I responded to what information sonar continued to feed me. Based on what I was seeing on sonar, with white bass moving closer to shore and closer to the surface as the sunlight began to dim, we put away the downrigging equipment around 8:15 PM and began to search on the surface for signs of topwater feeding fish. 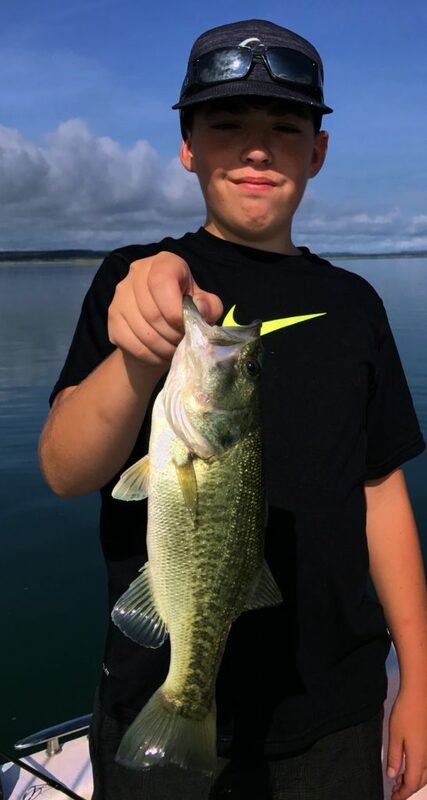 By 8:25 we had found what we were looking for and spent the next 25 minutes throwing quarter ounce grubs to topwater feeding largemouth bass and white bass in large schools. We took our grand total up to 60 fish before the topwater action ended at 8:55. Brandon was beyond enthusiastic about all he had learned and the potential these lessons held for making his son successful. To me, this was very gratifying.